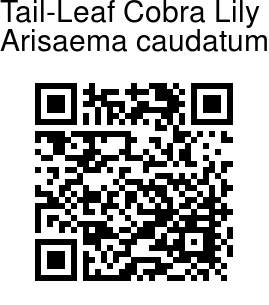 Tail-Leaf Cobra Lily is a perennial herb distinguished by its single digitately compound leaf with 5 narrow-elliptic leaflets ending in long thread-like tails. 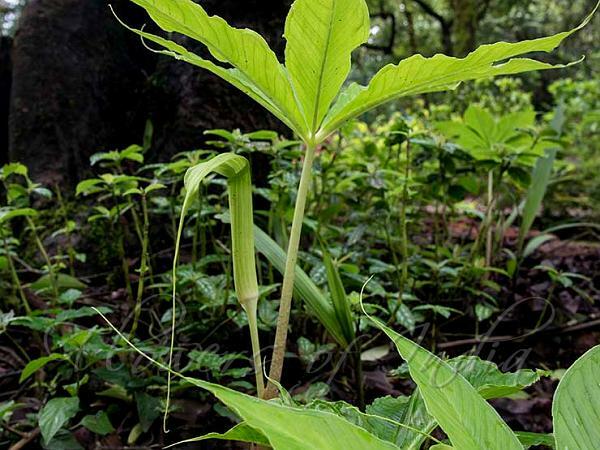 Flowers are borne in a green cobra-hood like structure, with the tube of the spathe elongated cylindrical, hood incurved ovate-lanceshaped, rather abruptly narrowed into a very long tail. Spathe is about 15 cm long without the 7 cm long tail-like tip. The spadix carrying the actual flowers is hidden inside the spathe, with a rounded tip, barely visible from the spathe. Leaflets are stalked, about 12 cm long, 5 cm broad, without the thread-like tips. Tail-Leaf Cobra Lily is found in the Konkan region of Western Ghats. Identification credit: Pascal Bruggeman Photographed in Mahabhaleshwar, Maharashtra.